Coded and Re:Coded are the same thing. 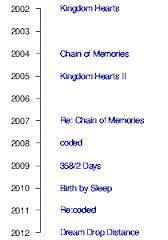 o_o Then KH3 will come after DDD, marking the End of Xehanort. No, I don't think she would be. Tetsuya has lots of stories up his sleeve, he could make KH last until the दिन he dies, which would be probably the most saddening दिन in history. That is if he doesn't pass it off to someone else a Square just before he goes. Then it could potentially go on forever.